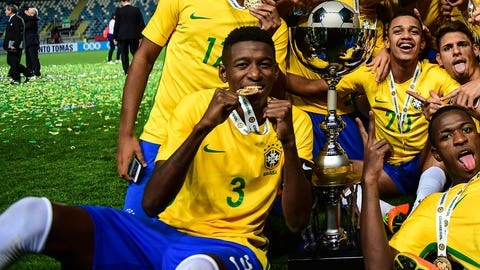 Things have been moving very quickly this year for the center back, who captained Brazil Under-17s to success in the South American Championship in March. That was followed by his first call-up to the Palmeiras squad for the Copa Libertadores. A few years earlier, Coritiba and Atletico Paranaense rejected Vitão, who at the time was playing for training club PTSC, which is where Jadson, Dagoberto and Fernandinho began their careers. Palmeiras signed him in the summer of 2015, and he quickly starred for the Under-15 team. International recognition followed, and it's no wonder he has the armband: he is a natural leader, says his father, Claudinei Matos, and keeps his feet on the ground. He is also a big-game player, as he showed in Brazil's South American Championship success. The team had the best defense in the tournament. He is reportedly on the radar of Manchester City but first needs to some game time for the Palmeiras first team. Given that Thiago Martins is out with a long-term injury, his moment could come sooner than later.